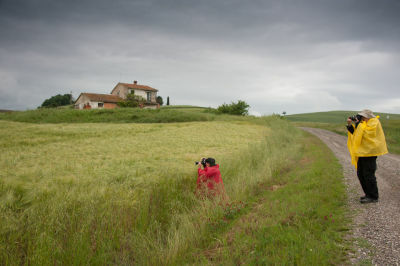 Last May I met two American photographers , who came to do a photo tour of Tuscany in one day: Joanne and Larry Mars . I had an appointment at their house at 5 in the morning , to go shooting before dawn. When I left home it was pouring , some also discouraged by the bad weather for the day I went to pick them up anyway . Check them , but he continued to pour. I said to myself , surely they will remain in bed asleep … but me I see them coming with raincoat and hat , ready for anything … what real photographers ! Let’s start with the hope that the rain stops , but at the moment of sunrise (obviously behind a beautiful blanket of clouds ) we stop near Pienza and begin to take pictures in the dark and under the deluge . The Tuscan ‘s so beautiful that even under these weather conditions it is worth groped to take some photos . We share and we stop to have breakfast , a long breakfast while waiting for the rain to stop . Since the spring weather there anyway we decided to go take some pictures in Montepulciano. I must say that in spite of the rain we did a few shots in the historic center that was worth it. Montepulciano , with its narrow streets( chiassini ) is always characteristic , even when it rains. Finally the rain stops , even if the clouds remain. We decide to bring us into the open country . It rains at times , but do not give up . The photo on the left was made while it was drizzling . I must say that despite the bad weather we did some spectacular photos . Our patience pays us back in mid-day when the rain stops and we can finally dedicate to take pictures of spectacular light, that after the storm is usually stunning , much better than the classic sunny day with no clouds. But let’s talk about Joanne and Larry , two great people with a great enthusiasm for photography , not at all deterred by the weather ( to tell the truth when I went to pick them up in the morning I was hoping to tell me you want to go back to bed to sleep), always ready to take pictures … as they should be all the serious photographer ! I wanted to dedicate this article to Joanne and Larry because they are two photographers incredible , full of enthusiasm for the scenery of the Tuscan countryside and for their great sympathy. What a lovely narrative of the day that we spent with you. The amazing narrow lanes of the towns and rolling landscapes of the Val d’Orcia area of Tuscany are well documented through the beautiful images we got. You went out of your way to make sure that our day was successful in spite of the rain. It was a very special day that we will never forget! We cannot thank you enough. You are a shining star and we would recommend your services to any photographer thinking of going to Tuscany and surrounding areas.